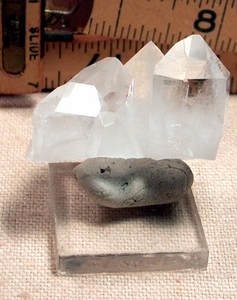 Rare shield faced crystals [only six edges to the main facet] grace this Arkansas miniature quartz cluster, and one has one of the tiniest bright uncommon 7h faces we've noticed. The group is 1-1/8x 1-3/4x 1" high. Clear, devic veils, milk base in nascent regrowth, rainbows, growth marks, slight titanium shading to select faces - a little powerhouse for your collection.